Millions of Americans treat their chronic pain with over-the-counter pain relievers and prescription pain medications, yet few realize that they’re actually doing more harm than good to their bodies. These drugs offer temporary relief but do nothing to halt the progression of tissue damage. Continued use of pain medications may instead worsen one’s condition, whether it be arthritis, fibromyalgia, pain due to a musculoskeletal injury, or another autoimmune condition. 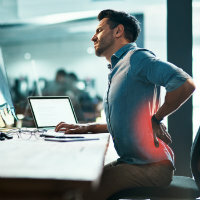 Identifying a natural, non-addictive solution is key to helping patients manage their inflammation and pain successfully without creating other health issues and in time, restore them to good health. Bovine colostrum offers hope to the millions of people suffering with chronic pain. Read about this “healing miracle” from Douglas Wyatt, J.D., the “Modern Father of Colostrum” who has spent the last quarter century researching, developing, and perfecting this nutritional supplement which offers true healing for everyone who needs it.